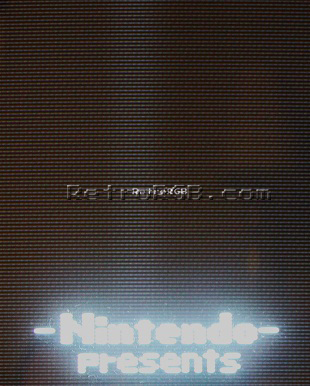 The vertical line is most noticeable right when the console is powered on (hence the above shot), or in games with lots of dark scenes, such as Super Metroid. It’s believed the vertical bar is caused by the power drop during DRAM refresh; Esentially, an inefficient power filter. This is something I remember seeing when I was a kid and it’s a widely talked about issue. – Start by adding a 16v 470uF capacitor to the voltage regulator (which is attached to the heatsink), as shown in the bottom-right picture. Note the orientation of the cap and that the negative end (the side with the stripe) is connected to the center pin! If that doesn’t work, you can try a 1000uF cap as well. 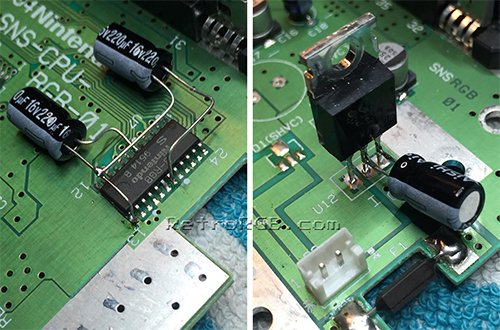 I’ve personally seen an RGB bypass fix the white line issue on many SNES consoles and it’s one of the reasons I’ve recommended beginners use a bypass instead of the on-board amp for the Mini. 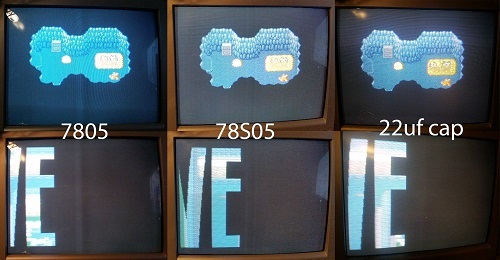 That being said, if you have a 1CHIP (no RGB mod needed), or if you’ve already done the on-board RGB mod to a SNES Mini, then the above fix might be a better overall solution. Also, adding an RGB amp will not fix the white line for composite video out, only RGB! There have been a few other fixes reported over the years. I haven’t had time to test them, but wanted to add the information in case it could help someone else.